A Touch Of Luxury, Edwardian Style. The year is 1911. The British Empire is at its peak. The country is enjoying the rising tide of Edwardian prosperity. God’s in his heaven and all’s well with the world. So what do you give the man who has everything? One of these new-fangled motorcars, perhaps – maybe a Daimler-Benz or a De Dion Bouton? No. You give him one of these. Judging by the shape it’s a safety pen and it’s made by Mabie Todd & Bard for the princely sum of twelve guineas, or more if you want to go for an even higher specification. I think if ’twere me, I’d settle for this one. Solid gold, turquoise and diamonds is enough. More would be vulgar. It’s pretty well impossible to calculate how much that would be in today’s serially devalued pounds and pennies, but it can be put in perspective by noting that the company’s cheapest writing instrument, the Cygnet No 2 Stylo, cost five shillings. 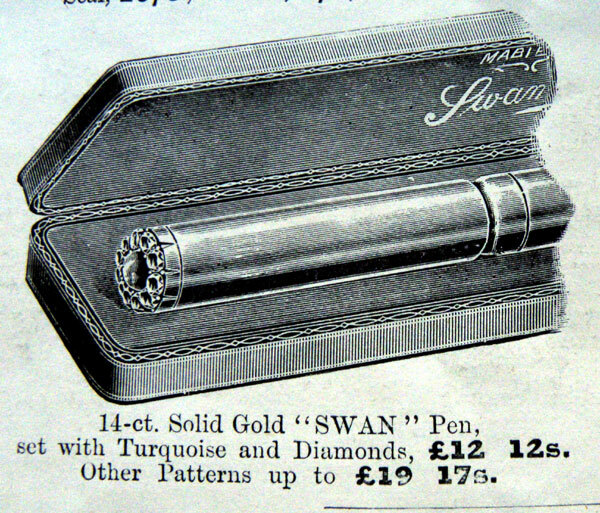 For the price of one solid gold Swan with its turquoise and diamonds, you could buy fifty-seven stylos and still have change left over. I have to concede, then, that ridiculously opulent pens were targeted at people of scant wisdom and poor taste even before the age of Krone and the Limited Editions. Still, at least it doesn’t have Swarovski Crystals or a fragment of the DNA of some luminary or other. For all I know, you may even have been able to write with it. I can’t say with any certainty, as this pen has not yet crossed my humble workbench. ← Pens, Nibs And Points. That’s £700 to £1100 in today’s money according to the National Aechives historical currency converter (using 2005 as a reference point). Not a lot different from a super high end pen today. The Cygnet 2 by contrast works out at about £15. It’s a lot to pay for a pen. My frugal soul would never let me spend so much. Most I ever paid for a single pen was £80 for a Ford Patent Pen.